Scientists have discovered and demonstrated a new technique to remove and store atmospheric carbon dioxide while generating carbon-negative hydrogen and producing alkalinity, which can be used to offset ocean acidification. Led by Greg Rau, a senior scientist in the Institute of Marine Sciences at UC Santa Cruz and a visiting scientist at Lawrence Livermore National Laboratory (LLNL), the team demonstrated their method at a laboratory scale. The system uses the acidity normally produced in saline water electrolysis to accelerate silicate mineral dissolution while producing hydrogen fuel and other gases. The resulting electrolyte solution was shown to be significantly elevated in hydroxide concentration, and it strongly absorbed and retained atmospheric carbon dioxide. Further, the researchers suggest that the carbonate and bicarbonate produced in the process could be used to mitigate ongoing ocean acidification, similar to how antacids neutralize excess acid in the stomach. "We not only found a way to remove and store carbon dioxide from the atmosphere while producing valuable hydrogen, we also suggest that we can help save marine ecosystems with this new technique," said Rau, the lead author of a paper on the study published in the Proceedings of the National Academy of Sciences. When carbon dioxide is released into the atmosphere, a significant fraction is passively taken up by the ocean, forming carbonic acid that makes the ocean more acidic. 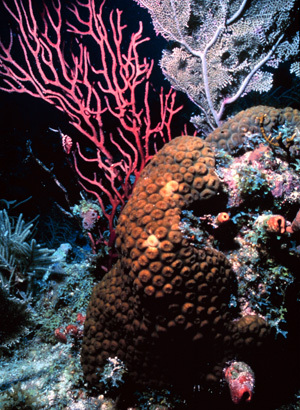 This acidification has been shown to be harmful to many species of marine life, especially corals and shellfish. Climate scientists estimate that by the middle of this century, the increasing concentration of carbon dioxide in the atmosphere will lead to global warming of at least 2 degrees Celsius and a more than 60 percent increase in ocean acidity relative to pre-industrial levels. The alkaline solution generated by the new process could be added to the ocean to help neutralize this acid and help offset its effects on marine biota. The authors noted, however, that further research is needed to evaluate the potential for large-scale application. "When powered by renewable electricity and consuming globally abundant minerals and saline solutions, such systems at scale might provide a relatively efficient, high-capacity means to consume and store excess atmospheric carbon dioxide as environmentally beneficial seawater bicarbonate or carbonate," Rau said. "The process also would produce a carbon-negative 'super-green' fuel or chemical feedstock in the form of hydrogen." Most previously described chemical methods of atmospheric carbon dioxide capture and storage are costly, using thermal or mechanical procedures to concentrate molecular carbon dioxide from the air while recycling reagents, a process that is cumbersome, inefficient, and expensive. "Our process avoids most of these issues by not requiring carbon dioxide to be concentrated from air and stored in a molecular form, pointing the way to more cost-effective, environmentally beneficial, and safer air carbon dioxide management with added benefits of renewable hydrogen fuel production and ocean alkalinity addition," Rau said. The team concluded that further research is needed to determine optimum designs and operating procedures, cost-effectiveness, and the net environmental impact or benefit of electrochemically mediated air carbon dioxide capture and hydrogen production using base minerals. Other researchers involved in the study include Susan Carroll, William Bourcier, Michael Singleton, Megan Smith, and Roger Aines, all at Lawrence Livermore National Laboratory.